It was a beautiful Saturday on Washington Blvd in Culver City, which opened the world to the terrific galleries tucked away on this sleepy street flanked by some of the busiest byways in the city. The art was overwhelmingly positive, and I was fortunate to stumble upon museum-worthy art pieces from Monique Van Genderen at Susanne Vielmetter, whose work was simply breath-taking. I enjoy over-sized artworks. The grandiosity stuns, if only momentarily, creating a captivating escape which is exclusive to the fine arts. The fact Ms. Van Genderen does so in this series with a consistent blank canvas, and colors each piece entirely differentiated from the next, is easier said than done. It is challenging in its own right to hold steadfast to a bare canvas color; for drudgery may set in on dealing redundantly with monotony. But she handles this burden honorably, experimenting with the sensation of space, texture, color, and most notably original, the magnification of graffiti. How else are we to interpret the successful transplantation of jaggedly angular and brutish paint strokes, reminiscent of English letters which are created in a hastily urban fashion, more concerned with their creation under the cloak of darkness rather than their perfection? Not to say that this paint-crafting is imperfect, only that we are impressed by the realistic surge of creative whir as opposed to a more fastidious meditation to making art which many artists find therapeutic – but also a curse. Trying to obtain perfection by having perfection on the mind’s eye can lead to an atrocious mentality of not being able to begin making art in the first place, as I have suggested with my essay On the Struggling Artist. With this piece, collectively with the paint drippings and unevenness of the horizontal lines at the bottom of the large canvas, we can appreciate the beauty in imperfection, as we must, for that is the quintessence of the human condition. 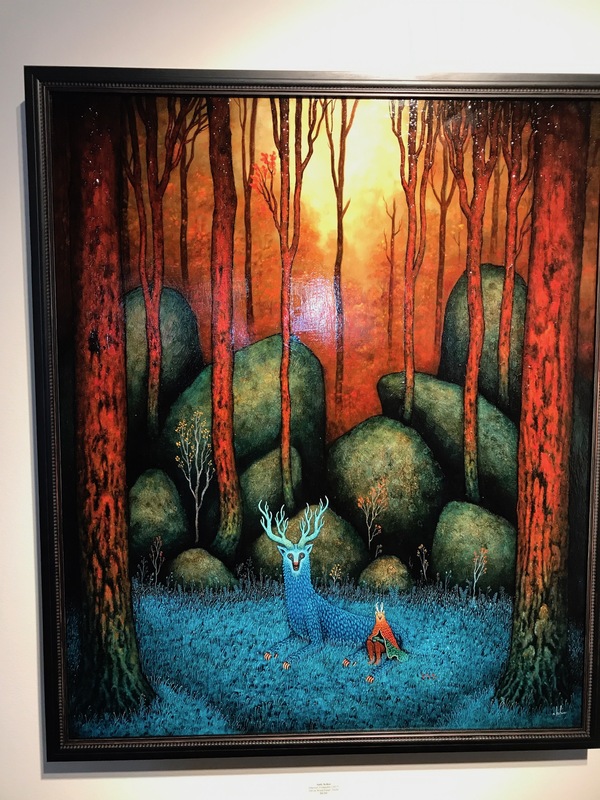 While Ms. Van Genderen imposed magnitude, Mr. Andy Kehoe gives us wonder with his collection found at Thinkspace Gallery. The collection, titled Prismatic, invites us into a surreal, if not magical, world of anthropomorphic deer and their residency in ethereal forestry. What is most consistent in the series which brings to life this almost childishly imaginative universe is the lonesomeness in each composition. Perhaps it is a metaphor for our own insignificance in a grander scope than we can imagine? Or that we are unappreciative of the genuine majesty of the cosmos and what it has brought forth in terms of the terraneous? The ostensible magic does not radically separate the world in this collection from Planet Earth, so it can speak to us about how we interact with our own world – and we often times do so like the magical creatures portrayed. The wonders of our nature are treated commonly just as ho-hum; we don’t know otherwise how beautiful it is to experience an alternative. Furthermore, the artwork invites us into exploring the unfamiliar with its eerie sentimentality. This is not, in other words, a lollipop land of sweet things. There is certainly something ominous woven into its fabric, but by searching for the sinister we are accomplishing the very activity of engaging with the unknown; we are being invited into an alien world; and such conscientious effort is more promotional of the mind than stupefying film which does not allow a subject to meditate on the possible worlds that whir by on the movie screen. I feel, however, some of the artwork would be able to impress a sense of vivacity by being imbued with glittery texture. For instance, what I feel is the keystone piece, Inherent Tranquility, the cloak of blue-green may have been painted with metallic silver, creating a livelier work that breaches the composition’s plane of existence by extending its presence visually outward by the would-be reflected light. Nevertheless, this was a delightful series. There was also another more curiously unique representation of the continuous absorption of paganist ritual within the Catholic umbrella. What makes this unique is the categorical Northern American Native artifacts infused with Catholic religiosity. T.S. Eliot in his Notes Towards a Definition of Culture remarked about the universality of Christianity, and it is exciting to witness once more how effortless it can be in acting as a bridge between pagan rites and the monotheistic God of Israel. It is, arguably, the redirection of the spiritual urge to respect the sacred as a dimension of human life. Last was a critique of information technology by Heath Bunting’s The Status Project. Mr. Bunting’s criticism geometrically maps every perfunctory data point that can and is being assembled as a set to represent what a human being is in today’s society. We are, more or less, treated as singular databases, completely impersonal and utilized in the highest fulfillment to coordinate data switches for advertisements. The data is not used to harmonize the world per se, as Mr. Bunting arguably deplores, and indeed can be seen to be a stepping stone toward Big Brother’s watchful eye over what humanity is becoming in front of Him. As predictive analytics becomes sharper, wherein a finite probability distribution can be measured for what a human being’s next move in the world will be, Mr. Bunting’s critique is poignant. But is there not hope that this ingenuity can be used by the forces of good? Why must goodness always be considered defensive rather than aggressive? Perhaps because selflessness typifies the Western Christian standard of good morality, and those that are selfless are contrary to those that are ambitious. It’s a disappointment, then, that we do not have, however idealized, the conception of the ambitiously righteous, which is consummately of natural nobility in humanity, intertwined within the information technological. How would such a figure use today’s technology for the greater good? Ending our walk through Culver City on a sorrowful note, we do not have the answer found here.